Welcome to a very special Monday! Today 200 food bloggers will dedicate their posts to raising awareness about hunger. I am so happy to be participating in this great cause. In addition to providing some information about hunger and links for more information, we will all post budget friendly recipes on our blogs today. Hunger is a close personal issue to me. My family was very low income and had to scrape to get by many weeks. We had a very large vegetable garden that helped a great deal (and 5 kids to provide all the labor!). If we ran out of groceries before the next paycheck came, we would eat big bowls of popcorn for dinner. Us kids didn’t care–popcorn nights were the best! But as an adult, I can now see and understand the worry my mom and stepdad faced week to week, paycheck to paycheck. I still remember the embarrassment on my moms face when I blurted out that we sold our horses so we could buy winter boots. My mom had to be pretty savvy about cooking on a limited budget. One of her go-to recipes was lentil sloppy joes. With this recipe, you can feed a family of four for less than $1.50 per person (this amount figures in pantry staples as well as fresh ingredients)! Not only is it budget-friendly, this recipe is very healthy to boot and is comprised primarily of pantry staples. I call attention to the amount spent per person for the lentil sloppy joe recipe because this figure is very important to many families, especially those who participate in SNAP, the nation’s food stamp program. The Giving Table (organizer of the Food Bloggers Against Hunger) states that SNAP recipients are limited to an average of $3-$4 per person each day to supplement their food budget. Additionally, the government subsidizes products like soy beans, wheat, and corn instead of fresh produce, so the most affordable food is often the unhealthiest. Furthermore, 1 in 4 families are skipping healthy food purchases often or always due to price (click here for more info). Overall, more than 50 million Americans face food insecurity. In a nation of such abundance, this sad fact is difficult to believe and even more difficult to ignore. The issue of hunger among children is especially heartwrenching. Children who do not get the proper nutrition are not as healthy as other children (see here) and have lower academic performance. When you are thinking about how hungry you are, it is difficult to focus on school work. Much has been done in schools to ease this issue. Free lunches are provided to children who qualify based on income. Our family received free school lunches, which we took advantage of several days a week. Despite measures being taken to provide school lunches to all children in need, this does not address the issue of children showing up to school hungry or going home to a house with limited food. 3 out of 5 teachers say they have children in their classrooms who regularly come to school hungry (from the Hunger In Our Schools Study). Many teachers bring food to school to help children who arrive hungry to school in order to help them concentrate through the morning. If you want to help protect funding for federal nutrition programs, click here. Fresh foods are often more expensive than processed foods, preventing some families from buying fresh produce. Organic produce is even more expensive. I have hope that this issue can be eased. In fact, in Grand Rapids, MI, where I live, I’ve seen progress toward this issue. The Fulton Street Farmer’s Market is one place of progressive change. They offer the Double Up Food Bucks program. When a person eligible for SNAP (Supplemental Nutrition Assistance Program) uses his or her SNAP Bridge Card to shop for food at a farmers’ market, the amount of money that he or she spends is matched with Double Up Food Bucks bonus tokens. The tokens can then be exchanged for Michigan-grown fruits and vegetables. For more information on this wonderful program, click here. Shoppers who do not have a farmer’s market or a program like Double Up Food Bucks, can still take advantage of lower-cost produce. With some tasty recipes, a home cook can transform inexpensive produce and pantry staples into fabulous meals. There are several budget-friendly dishes that you can find on my blog; several can be made for $4! For example, for just $4, a family can dig into this silky, gingery cabbage dish. For just $4, you can also make these lentil-rice stuffed collard greens. This red lentil dal is another quick and inexpensive recipe, relying primarily on pantry ingredients. Finally, my favorite! Polenta is a cheap, filling, and healthy meal base. Serve with oven roasted vegetables and you have an inexpensive, healthy, and filling meal. Click here for my polenta with roasted vegetables en papillote recipe. Please join the No Kid Hungry campaign in standing up for kids in need. Urge your members of Congress to protect federal nutrition programs that feed our nation’s hungry kids. Just click here to get started. It only takes a minute at most. Head over to the No Kid Hungry website to donate or to find local and national organizations in your area. These organizations are always looking for helping hands. Watch A Place At The Table to understand more about our nations food crisis. Try to live off of $4 for one day to put yourself in the shoes of a food insecure person. 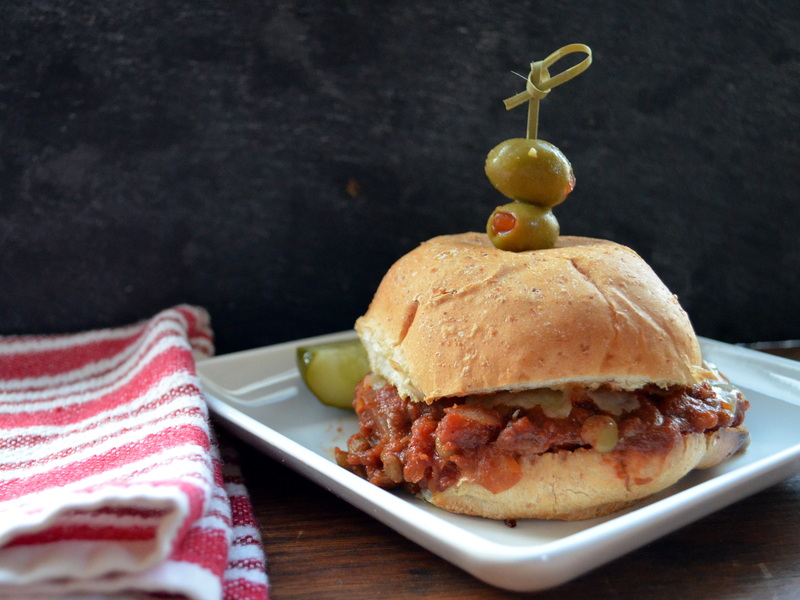 Make the lentil sloppy joe recipe below! I think it is way better than “real” sloppy joes. I promise–you won’t miss the meat. Put lentils and water in a small pot and bring to a boil. Reduce heat to low and simmer, covered, until tender. This will take about 30 minutes. While lentils are cooking, heat olive oil in a large skilled over medium heat. When hot, add onions and green pepper and cook until the onions have softened somewhat, about 4 minutes. Add tomatoes, garlic, tomato paste, ketchup, mustard powder, chili powder, molasses, and vinegar. Season to taste with salt and pepper. Turn heat to lowest setting and simmer 10 minutes until thickened. Stir cooked lentils into sauce mixture. Serve on toasted buns. This recipe is vegan as-is but you can add a slice of cheese to the top of the mixture on the bun and melt it under the broiler if you are not vegan. Oh thanks so much, Mistel!!! Love you too! Wow you make lentils look so yummy and the back story so heart warming. Making this for dinner. Wonderful post, Aura. It’s so hard to believe, in a country as rich as ours, that so many go hungry. Thanks for the reminder. And lentil sloppy joe’s for all! Great post Aura! Going through and reading everyone’s post is interesting, heartbreaking but definitely a must! Glad you shared your story, more of us need to know that it can touch anyone! Also, love the recipe for the lentil burgers- low cost and filling, a perfect combo!